The vast wilderness of the Blue Mountains, its towering cliffs rising high above deep forested valleys, presents the appearance of a great natural fortress, whose cloudy, mist-enshrouded heights hold countless mysteries of our ancient past. This wilderness had long been home to Aboriginal tribes, and earlier stone-age races as we have seen; and, as I am about to show, it had also been a principal cultural region of the Uru, as evidenced by the thousands of rock inscriptions altar stones, temples and astronomical observation sites left by this people. Here once stood a highly-organised, widely-distributed network of habitation, ceremonial, religious and astronomical centres, linked by tracks that criss-crossed the landscape; occupied by a population at times numbering many hundreds, perhaps thousands of people, governed by powerful rulers, backed by a priestly caste of astronomer-mathematicians and a warrior army. to be Ay-I, Supreme Being of the Uru civilisation . Photo © Rex Gilroy 2004. 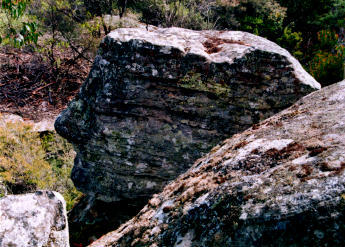 As stated in the Introduction, it was Aboriginal myths and legends of stone-building “culture-heroes” who inhabited Australia in the long-ago “Dreamtime”, that first led me in 1965, to propose the theory that an advanced race of megalithic monument-building people had inhabited this continent; and that, ignoring the protests of negative-minded academics, I persisted in my researches, until one day in January 1965, I uncovered the remains of an extensive megalithic culture centre, situated in dense scrubland overlooking a valley deep in the Blue Mountains. Emerging from scrub I found myself standing at the foot of a 15 metre tall mound of sandstone boulders and rubble, the remains of a ceremonial structure. Halfway up its western side sat a large rock, naturally weathered into a reptilian head [I later wondered if this rock had not been specially chosen for this structure]. Crumbling stone slab steps led up from the western base past this ‘head’ to the summit, where I found, upon a flat sandstone base facing east, a large altar stone, its flat top carved in relief in the form of a serpent. Nearby on the mound’s southern edge was a squarish slab bearing a large stone smoothed and rounded in the form of a sun-disc. The altar, standing on a north-south axis, measured 1.7m long by 70cm wide and 1.2cm in height. The serpent, carved in a curved aspect, bore a [mouth] groove at its northern [head] end. Beside the altar a large boulder bore a long deep groove, denoting the Uruan letter ‘N’ for Nim, God of the Sun. 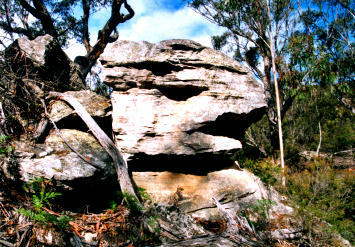 A search of nearby rocks some metres west soon revealed another “Serpent Altar”, carved atop a 3m high sandstone block. he serpent, cut in relief, measured 3.9m in length by 30cm wide at the head, the body width measuring from 15cm to 34cm as it broadens in width towards a rounded end. There is a groove cut deep into the left side of the mid-body thought to be the Uruan letter ‘N’ for Nim. Nearby I found another altar, carved in relief in the form of an eagle on an east-west axis. The beak points north as does the left wing, the right one being barely mentioned by a bulge. 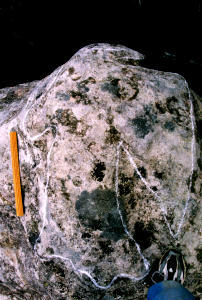 The figure measures 1.5m from left to right wing. The eagle altar stands atop a 3m tall rock.These and other altars hereabouts formed a long-abandoned ceremonial ground covering some several hundred square metres. That all the altars face the east identifies them with Sun Worship. Another, much larger Eagle Altar was found by me in 1974 a few kilometres to the south, reached by climbing a 6m high sandstone rock of skull-like formation. religious mythology, carried the Sun-God Nim across the heavens each day in his beak. The eagle, carved in relief, measures 72cm in length from head to tail, by 1.28m wide from its right [barely depicted] wing to outstretched left wing, which like the beak points south. Once again, this altar faces east. 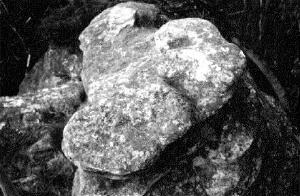 Other Serpent and Eagle Altars came to light across the Blue Mountains in the years ahead; however it was the 1965 discoveries which first provided me with the proof I needed to support my theory, that a megalith-building people had once inhabited Australia. Who they were I had yet to learn. It was not until 1974, while searching for ancient rock art around Leura-Katoomba that I chanced to make my first discoveries of what turned out to be the written language of this mystery race. The script, consisting of strokes and dots interwoven with pictographic symbols, soon began turning up at many locations throughout the area. Eventually I discovered that many of the symbols occurred in the ancient scripts of the Southeast Asian and west Pacific regions. As already shown in the Introduction, the Uruan ‘mother’ script would in time influence the written languages of the ancient Indo-Aryan world and the Celto-Phoenician scripts in particular, assisting me in my efforts to translate that of the Uru. Through these translation efforts the knowledge of the ‘lost’ astronomical science of this race is at last being re-discovered. The Uru were obsessed with the heavenly movements, and the Sun and Moon in particular, with which their religion was irrevocably tied. Their often massive, extensive astronomical stone arrangements and observation sites cover Australia, and although astronomically-aligned stone arrangements in the sandstone country of the Blue Mountains are far less common, they established countless numbers of astronomical observation sites atop high places and at other open locations [many originally cleared for the purpose] wherever extensive views of the heavens were to be had. At these sites they engraved their observations, as well as at nearby associated shrines and temples. .